Thousands of Puerto Ricans were finally getting water and food rations Friday as an aid bottleneck began to ease, but many remained cut off from the basic necessities of life and were desperate for power, communications and other trappings of normality in the aftermath of Hurricane Maria. There were many people across the island, especially outside the capital, unable to get water, gas or generator fuel. That was despite the fact that military trucks laden with water bottles and other supplies began to reach even some remote parts of Puerto Rico and U.S. federal officials pointed to progress in the recovery effort, insisting that more gains would come soon. In some cases, aid that was being distributed by the Federal Emergency Management Agency was simply not enough to meet demand on an island of 3.4 million people where nearly everyone was still without power, half were without running water in their homes and the economy was still crippled from the effects of the storm that swept across the U.S. territory as a fierce Category 4 hurricane on Sept. 20. Photographers Ramon Espinosa, Gerald Herbert, and Carlos Giusti documented victims of Hurricane Maria and asked about their urgent needs in Puerto Rico. "Don't forget the weakest (people), us elderly folks." 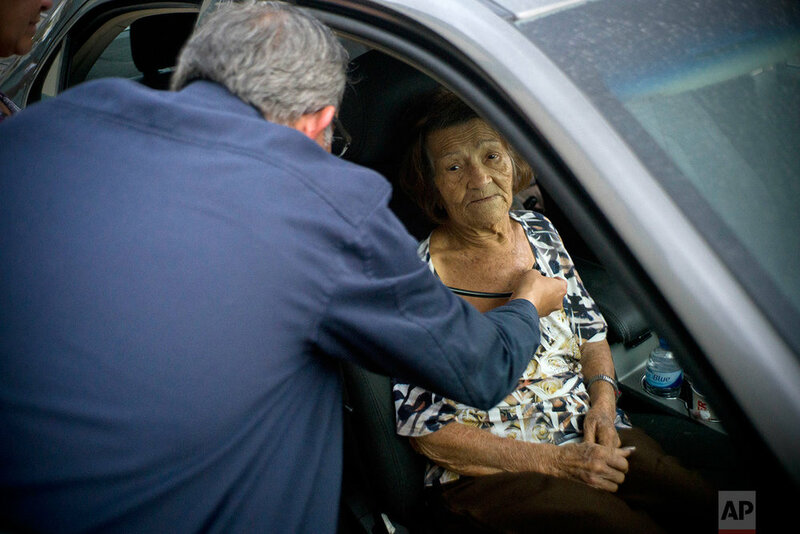 Carmen Hernandez, who lives in a senior living facility that lacks water and electricity in the wake of Hurricane Maria, is checked on by a doctor after she fell down, as she sits still for the doctor inside a car parked outside the hospital for lack of space at the hospital, in Bayamon, Puerto Rico, Thursday, Sept. 28, 2017. Hernandez most desired for people to care for the island's senior citizens in terms of restoring utilities during such high temperatures. "Don't forget the weakest (people), us elderly folks." "Water is not reaching the neighborhood." Lebron Eduardo poses for a portrait as he makes his daily trip to a drinking water supply station in Santa Isabel, Puerto Rico, Sept. 29, 2017. Eduardo said his greatest need at the moment is water. "Water is not reaching the neighborhood", said the 60-year-old Santa Isabel resident. "We don't have anywhere to sleep, we don't have our stuff." Sandy Nieves poses for a portrait in the door of her heavily damaged home in the aftermath of Hurricane Maria in Yabucoa, Puerto Rico, Sept. 29, 2017. Nieves said her greatest need is her home and especially her baby's bed. "We don't have anywhere to sleep, we don't have our stuff. We are all sleeping in one bed at my mom's house." "People have their checks deposited in banks and they cannot withdraw money." Fruit seller Julio Rivera, 69, tries to keep his business afloat from the back of a truck after Hurricane Maria in Salinas, Puerto Rico, Sept. 29, 2017. Rivera said his greatest need is access to cash. "People have their checks deposited in banks and they cannot withdraw money. They don't have the money to buy what they need," Rivera said. "Food gets to the supermarkets, but they run out almost immediately." Maria Yuseno poses for a portrait with her daughter Edmary Martinez as she sweeps out her carport containing belongings salvaged from their damaged home after the passing of Hurricane Maria in Yabucoa, Puerto Rico, Sept. 29, 2017. They say their most urgent need is food. Edmary says; "Food gets to the supermarkets, but they run out almost immediately. And the ships, they aren't arriving." "Right now we don't even have a little bottle of water in the house." 13-year-old Dereck Laguna accompanies his stepfather Jose Figueroa as they stop along the highway where they located water in Cayey, Puerto Rico, Sept. 29, 2017. Laguna and Figueroa said their greatest need is water. "Right now we don't even have a little bottle of water in the house. At least I move around, I have my car and I look for water to drink. It's hard to do but you have to move around," Figueroa said. "It's too hard. This is the house my parents left me." Sonia Rodriguez stands in her home damaged by the passage of Hurricane Maria in Salinas, Puerto Rico, Sept. 29, 2017. Rodriguez said her greatest need is to replace her home's roof. "It's too hard. This is the house my parents left me. They already died. To lose it like that after so much effort to maintain it ... at least I'm alive", Rodriguez said while trying to hold back tears. "Apart from the bad experience of the hurricane, it's something that is uniting us." 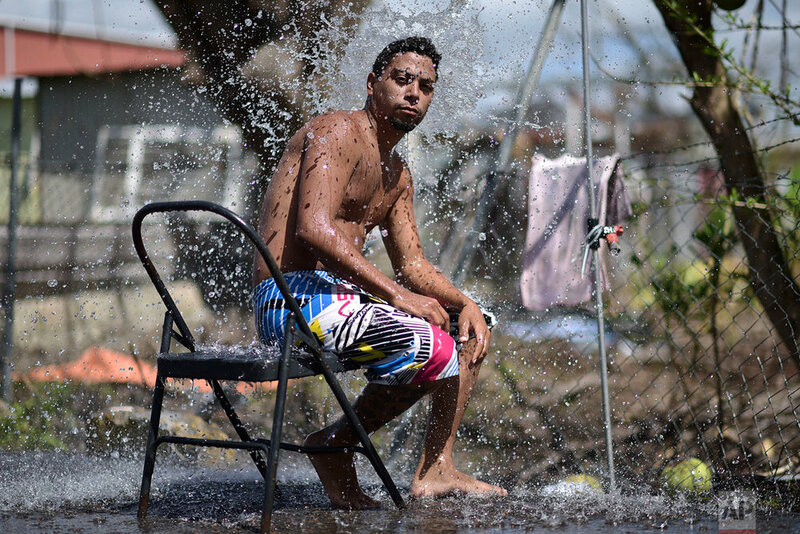 Jorge Ortiz, 25, takes a shower using well water on the side of the road in Santa Isabel, Puerto Rico, Sept. 29, 2017. Ortiz, who lives in Cocal, said his greatest need is water. "People come and supply water to their relatives. Children are bathing and neighbors are cooking. Apart from the bad experience of the hurricane, it's something that is uniting us," Ortiz said. "The storm premiered it for me." Rafael Velazquez, a resident of Cayey, poses for a portrait next to his boat lying on the bank after the storm surge brought by Hurricane Maria in Santa Isabel, Puerto Rico, Sept. 29, 2017. Velazquez, who is applying to study his doctorate in chemical physics at the University of Puerto Rico, said his greatest need is to put the boat back in the water. "I bought it a year ago and hadn't used it yet. The storm premiered it for me," said Velazquez. "We can get through this whole thing instead of everybody pushing for themselves." Cesar Lopategui poses for a portrait after hauling storm debris to the municipal dump, in the aftermath of Hurricane Maria in Yabucoa, Puerto Rico, Sept. 29, 2017. Lopategui said he feels the most important need is for people to unite. "We can get through this whole thing instead of everybody pushing for themselves." "The most necessary is water and canned food." Felix Davilla, who works at the Yabucoa dump, poses for a portrait in front of debris dropped off by residents in the aftermath of Hurricane Maria in Yabucoa, Puerto Rico, Sept. 29, 2017. "The most necessary is water and canned food. Also we have no electricity. And medicine. These (water, electricity, medicine) are our primary needs." "We need the electricity to return, since the elderly won't hold up much more with this situation." Emari Rodriguez poses for a portrait after filling up bottles at a water distribution center to take it home, which is intact, but lacks water and electricity, in the wake of Hurricane Maria in Bayamon, Puerto Rico, Thursday, Sept. 28, 2017. Rodriguez, who lacks water and electricity at home, but which is still in tact, said she's most worried about the elderly in her neighborhood. "We need the electricity to return, since the elderly won't hold up much more with this situation. We need to move forward." "After the hurricane, what I want is help for the people who are in the most devastated areas." 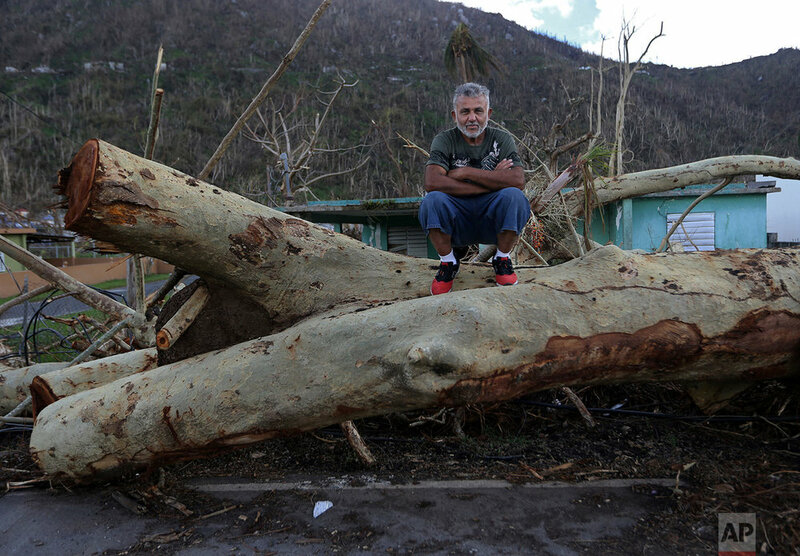 Martin Ruiz poses for a portrait on a fallen tree in his neighborhood in the aftermath of Hurricane Maria in Yabucoa, Puerto Rico, Sept. 29, 2017. "After the hurricane, what I want is help for the people who are in the most devastated areas. In my case, there were no problems. In my home there was very little damage. But there are other relatives, who lost their home, their clothes, and they are need. For the moment I am fine." Text from the AP news story, Aid flows to Puerto Rico but many still lack water and food, by Ben Fox and Danica Coto.